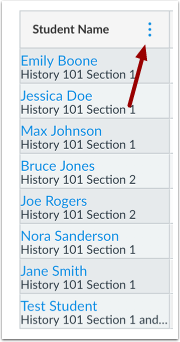 How do I sort and display student names in the Student Name column in the New Gradebook? The Student Name column displays the students in your course. You can view options to sort names and display names by either first or last name. You can also choose to view concluded and inactive enrollments. Additionally, the Secondary Info menu allows secondary information to display below the student’s name. Options include the student’s section, SIS, ID, Login ID, or no display. Only one secondary information option can be displayed at one time. Note: Student names display according to the Sortable Name listed in a user's personal account settings. 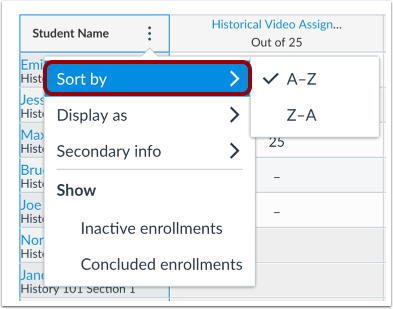 Hover over the Student Name column header and select the More Options menu. To sort names alphabetically, select the Sort by link. By default, names display from A-Z. To sort in descending order, click the Z-A option. To display names in a specific name order, select the Display as link. By default, names display as first name, last name. To sort in descending order, click the Last, First Name option. To view secondary information for students, select the Secondary info link. 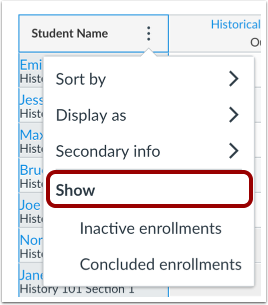 You can have the Student Name column display each student's section , SIS ID , Integration ID , or Login ID . You can also choose to have the column display no secondary information . 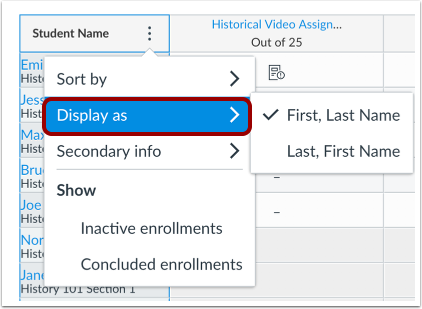 To view grades for inactive or concluded enrollments, view the Show section and select the Inactive enrollments or Concluded enrollments link. 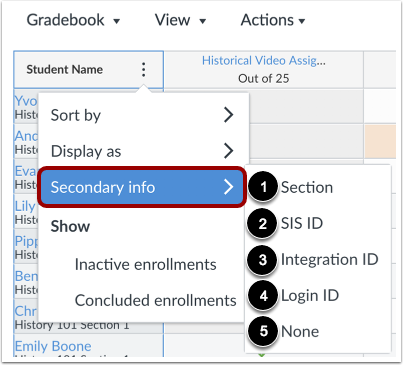 You can view both enrollment types at the same time in the Gradebook. 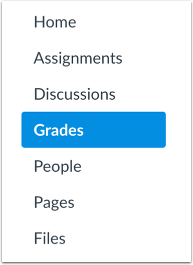 Previous Topic:How do I use assignment groups and the Total column in the New Gradebook? Next Topic:How do I view grades for inactive or concluded student enrollments in the New Gradebook? Table of Contents > New Gradebook > How do I sort and display student names in the Student Name column in the New Gradebook?